A few months ago, I wrote on the question of whether global warming is a good investment. The conclusion was no, as the global fund GWO was underperforming the S&P 500, and by a wide margin. This post shows that a US-based global warming fund, PBW, is underperforming also. In fact, PBW is even worse than GWO. 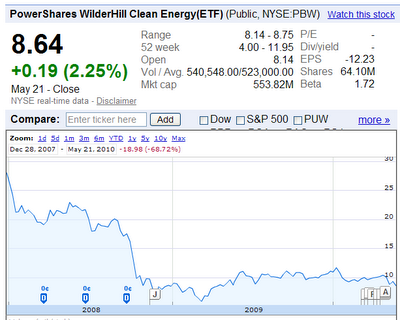 The first chart below shows the performance of PBW since January 2008, through May 21, 2010. The stock fund has declined almost 70 percent in value ($28 per share down to approximately $8.64 per share) see Figure 1 below. (more on the details and holdings of PBW may be found below). 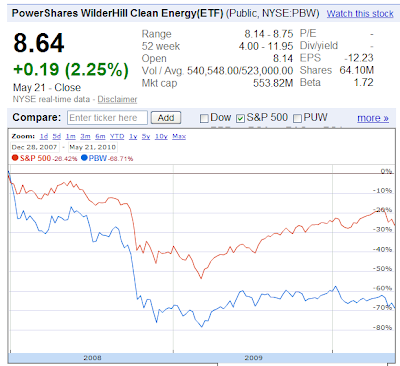 A comparison of how PBW fared against the S&P 500 is shown below as Figure 2. The S&P 500 declined along with almost every stock in the crash of late 2008, and has recovered somewhat since then. Yet, the S&P 500 has lost only 25 percent of its value from January 2008, while PBW has lost 70 percent of its value. As I wrote earlier, this is quite odd since, if the warmists are correct and the Earth must have massive and immediate changes to restrict or eliminate CO2 emissions from man's activities, then the companies represented by PBW should see zooming stock prices. These companies should enjoy rapid growth and investor confidence, as their customers purchase their products and services in a heroic effort to stem the flow of CO2, stop the polar ice from melting, halt the seas from rising, prevent the massive and frequent heat waves, and all the other horrific effects of global warming. But, investors are a tough lot, with plenty of alternatives in which to place their hard-earned money. PBW is apparently not on that list. A description of PBW states "The Fund will invest at least 80% of its total assets in common stocks of companies engaged in the business of the advancement of cleaner energy and conservation." Also, the fund is made up entirely of approximately 52 U.S. stocks.PowerShares WilderHill Clean Energy Portfolio’s top 10 holdings include SunPower Corp., Class A, Echelon Corp., Cypress Semiconductor Corp., Cree, Inc., First Solar, Inc., OM Group, Inc., Universal Display Corp., KYOCERA Corp. ADR (Japan), Suntech Power Holdings Co., Ltd. ADR (Cayman Islands) and Applied Materials, Inc.